for own laboratory by Korea Industrial Technology Association (KOITA). This accreditation is based on the Article 14, Section 2 of the Technology Development Promotion Law. 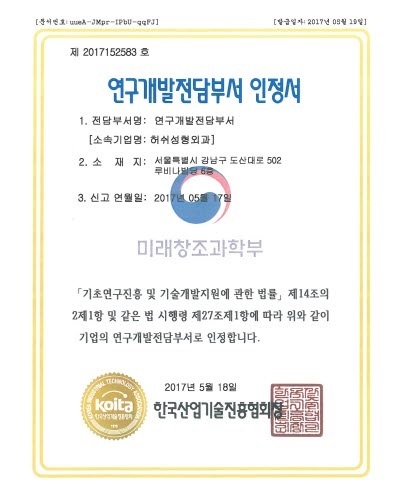 This explains that HERSHE laboratory is acknowledged as industrial R&D center according to KOITA’s standard. through research & development and investment. 28 HERSHE IS SELECTED AS THE BEST..
27 Award of the Grand Prize in Me..
26 Forbes magazine interview with..
24 SITM 2017 (Seoul International..
23 HERSHE attended KBEE(Korea Bra..
22 Accreditation as industrial R&..
20 2017.2.28 Ask your surgeon's n..
19 B&H Korea interview with Dr. J..